A power distribution system distributes electrical power throughout a building. Power distribution systems are used in every residential, commercial, and industrial building. Most of us are familiar with the power distribution system found in the average home. Power, purchased from a utility company, enters the house through a meter that records the electrical energy used. The incoming power then goes to a load center which provides circuit control and overcurrent protection. The power is distributed from the load center to various branch circuits for lighting, appliances, and electrical outlets. Careful planning is required so that the power distribution system safely and efficiently supplies adequate electric service for present and possible future needs. Load center is an industry term that applies to the types of panelboards used in residential or light commercial applications. The National Electrical Code® makes no distinction between a panelboard and a load center. 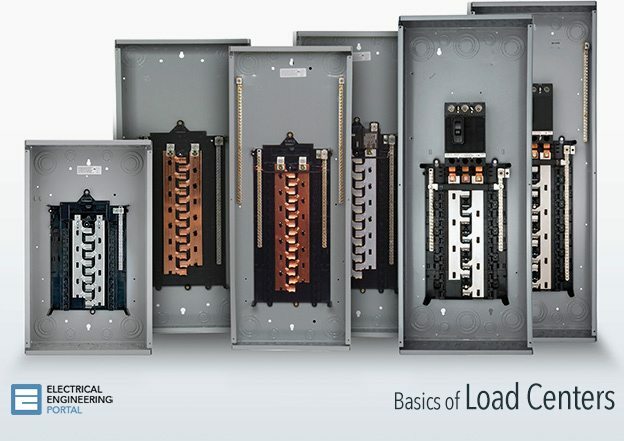 Rules and definitions that apply to panelboards also apply to load centers. The National Electrical Code® defines a panelboard as a single panel or group of panel units designed for assembly in the form of a single panel, including buses and automatic overcurrent devices, and equipped with or without switches for the control of light, heat, or power circuits; designed to be placed in a cabinet or cutout box placed in or against a wall, partition, or other support; and accessible only from the front (Article 1 00-Definitions). Load centers are constructed of the following three parts: enclosure, interior, and trim. The enclosure is typically constructed of cold rolled steel (for indoor use) or galvanized steel (for outdoor use). Together with the trim, the enclosure is designed to provide component and personnel protection. Knockouts are stamped into the enclosure to provide a convenient means of creating holes for use in routing electrical wiring. Approved cable clamps or conduit hubs are used in the holes to secure and protect the cable and conductors. The National Electrical Manufacturers Association (NEMA®) has established standards for electrical equipment enclosures. NEMA type 1 enclosure are intended for indoor use. NEMA type 3R enclosures are intended for outdoor use primarily to provide a degree of protection against rain, sleet and damage from external ice formation. Load center enclosures typically conform to one of these NEMA enclosure types. Thank you for this website. Very helpful to us when it comes to our practices. However, may i humbly ask to remove the password in excel? I cant trace the formulas used since it was protected. What should be the man power required for a load centre. Pls brief with a structure. When testing a panel board, lets say 120/240V, 200A with a low voltage source . How do you get all of the breakers to carry exactly the rated or 80% rated current?